BNN offers a summary of this week’s topical news in a variety of categories: Government; Conflict; Hope; EP Elections; Opinion; Agreement. Latvian politicians have commenced preliminary debates before the vote on New Unity politician Arturs Krišjāņis Kariņš’s forming government’s approval. BNN offers the pros and cons provided by opposition deputies. Kariņš said there are seven topics the government will focus on: sorting of the financial system, strengthening of rule of law, continuation of previous government’s initiated healthcare and education reforms, abolishment of MPC system, territorial reformation and resolution of demographic problems. «By accomplishing these tasks we will implement fiscal discipline principles and maintain a clear euro-Atlantic course,» he said. Kariņš also mentioned in his speech that «our [Latvia’s] neighbour Russia has become aggressive», adding that «this presents a challenge not only for Latvia but the rest of the world as well». In accordance with requirements of the Criminal Process Law, the prosecutor is required to launch criminal prosecution within ten days of receiving materials of the criminal case from an investigative institutions – in this case State Security Service. However, in the case with Juris Jurašs, the prosecutor received materials of the case on 8 January, but this term is already passed, says Jurašs’ lawyer Aleksandrs Berezins. He says if the Saeima decides in favour of allowing Jurašs’ criminal prosecution, the prosecutor is no longer able to make the decision on prosecuting him, because the term provided by the law has already run out. The lawyer explains he does not understand the prosecutor’s decision «if he knows it is written black on white that he has ten days to submit the case to the committee. Now that he has missed the deadline, he [the prosecutor] wants to do something. This is what I am confused about,» says Berezins. The State Security Service confirmed the criminal process was submitted to the prosecutor’s office on 8 January. As it is known, the Prosecutor General’s Office to the Saeima in which it is requested to commence criminal prosecution of Jurašs for disclosing and official secret. Considering the commitment of Latvia’s new transport minister to implement objectives detailed in the government declaration, as well as his own professional work in the transport sector, BATL believes the minister could pull it off. 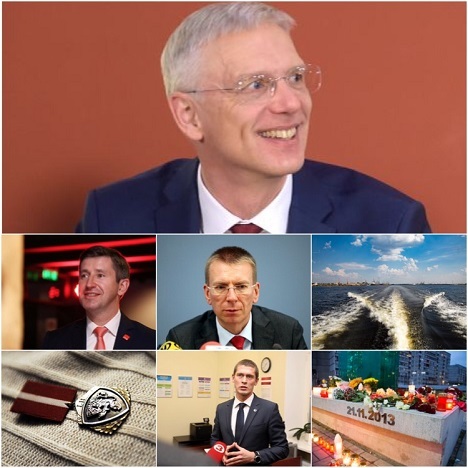 Harmony political party’s main candidate for European Parliament elections will be Saeima deputy and chairman of the Sustainable Development Committee Vjačeslavs Dombrovskis, as confirmed by Riga City Council Chairman Nils Ušakovs in an interview to LNT 900 seconds programme. He said this decision was made by the party unanimously. The party has yet to decide on its other candidates. ‘I think this was the correct decision – he is a politician with a great deal of experience and is publicly well-known and supported,’ said Ušakovs. As it is known, submission of candidate lists for the EP elections will be taking part from 6 March until 21 March. «It still remains unclear where Chairman of Ventspils Executive Committee Aivars Lembergs was during the January 1991 barricades. He has yet to provide a clear answer. However, in spite of that, Lembergs is not shy to mention in his biography that he was awarded the 1991 Barricade Participant’s Commemorative Badge,» BNN was told by Ventspils City Council opposition deputy Ģirts Valdis Kristovskis. Without a doubt these historic events and Ventspils residents who stood guard during this decisive period of Latvia’s history deserve respect. Unfortunately, commemorative events in Ventspils are left with no attention year after year. It is possible the commemoration of 1991 Barricades and Ventspils residents who took part in it is forgotten because nothing is known about the activities of Aivars Lembergs during the 1991 Barricades period. Considering the aforementioned, as well as the fact that to attract attention to and properly evaluate the participation of Ventspils residents in the January 1991 barricades need to be determined. Evaluation is also needed for certain facts about the involvement of Aivars Lembergs during this sensitive period of Latvia’s history. Latvia and Britain have reached a mutual agreement that in the event Britain exits the European Union without an agreement, the status of both countries’ citizens will not change after Brexit, said Latvian Foreign Affairs Minister Edgars Rinkēvičs in an interview to LTV programme Rīta panorama. He says a mutual agreement was reached on Monday, 21 January. However, official statements from the British government and Latvian Saeima are expected. «Saeima’s Foreign Affairs Committee has started working on it. Even after that we will still have many other matters to discuss, including law amendments. I don’t think things will go smoothly. Let’s be honest: it’s a process that cannot be properly predicted,» admits Rinkēvičs.